(12/18/15) – Nordic Food, in case you haven’t noticed, is quite The Thing right now. So much The Thing, in fact, that there are now articles on how it isn’t really The Thing any more. Interestingly (and to the point of this post) Nordic sometimes includes Iceland and sometimes doesn’t. Technically “Nordic” always includes Iceland, but people thinking about the food don’t. For the record the Nordic region is Iceland, Finland, Norway, Sweden, Denmark, the Aland Islands, Faroe Islands, and Greenland. I feel strongly about the inclusion of Icelandic food simply because I traveled there for a wedding a few years ago and ate a lot. There was also riding horses across the (cooled & hardened) lava flows, visiting museums, dunking in hot springs, and general traipsing about in a perpetual cold drizzle – but mostly there was the eating. Check out the menu at Cafe Loki in Reykjavik – this Flickr photo is what I could find in English, zoom in on the Icelandic plates. Sheep’s head jelly, hakarl (rotted shark), dried fish with butter, shots of Brennivin (a caraway laced strong spirit). Whole sheep heads are also traditional – there’s a great scene in the movie Jar City of the bachelor dinner, consisting of a sheep’s head in a to go container. Find the essay Dining Out in Iceland by Jason Wilson. It’s collected in the Best Travel Writing 2001 and it’s in JSTOR at this link. 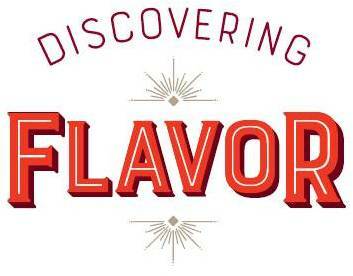 Read the preface to Discovering Flavor (of course I was going to suggest my own book – which you can buy in its entirety at this link). Open a jar of ammonia (approximating the smell – it’s often served in sealed mason jars to limit the disturbance to others seated between the kitchen and the diner). Close the jar of ammonia. Chew on a stale gummy bear (approximating the size and texture of the hakarl). Take a shot of moonshine, or other high proof, low flavor booze. Eat a mild blue cheese. “Icelandic” Lamb: This is riffing off of two things – one is the combination of the flavor of sea and land with lamb. I’ve seen “seaweed fed lamb” on the menu in Canada before (and ordered it) – here I simply added dulse flakes to rice as the base of the lamb dish to make the seaweed flavor happen. The other main flavor component was a combination of dates, mushrooms, and (again) briny flavors. That sounds gross, but I’ve in fact been in Iceland, and eaten at an Icelandic-Peruvian-Japanese fusion restaurant where this sort of flavor combination went on. Then, I found this recipe from Denmark for kale with capers and dates that seemed to support my memory of what I’d been eating. I added the mushrooms. That’s how we ended up with an Iceland-inspired lamb dish. White rice cooked with a generous dusting of dulse flakes – stir more in after it’s cooked if needed to reach your preferred sea-y flavor. Iceland Style Hot Dogs: We can’t actually get Icelandic hot dogs here because their hot dogs are made differently, including lamb meat. 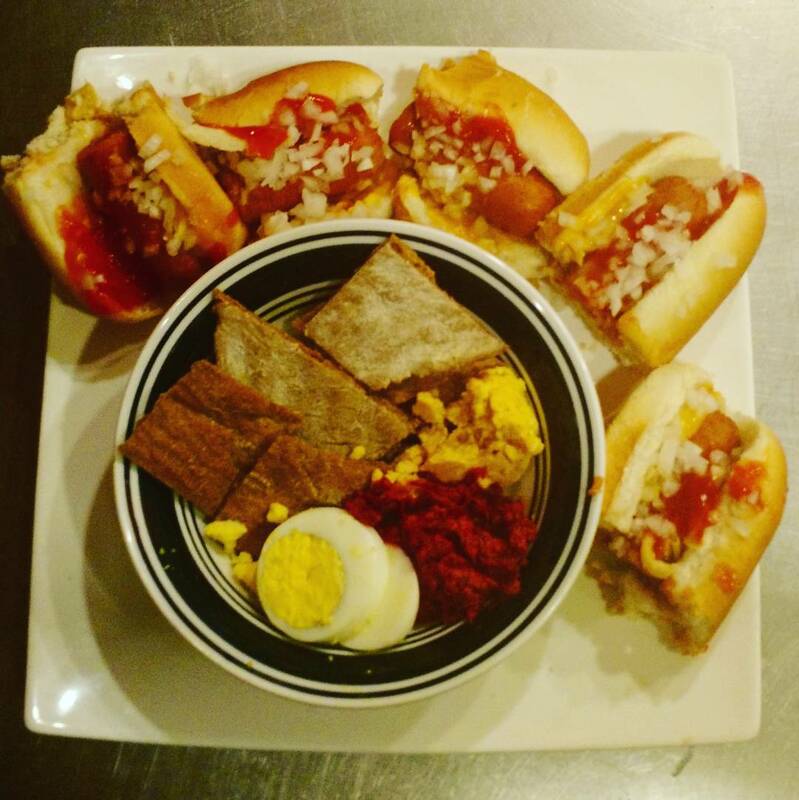 But they taste close enough to our hot dogs and adding the correct toppings creates “Iceland Style Hot Dogs”. Apply to the bun in this order: Remoulade, French’s fried onions, hot dog, sweet brown mustard, ketchup, minced white onion. A travel article about these dogs from Conde Nast Traveler is linked here. I was completely remiss in my study of Icelandic desserts while traveling there. I can’t think of any desserts I had – except a bag of Haribo candies I ate to try to erase the hakarl aftertaste (no luck). But there was Skyr (thick yogurt) everywhere, including on the airplane. A simple way to pay homage to Skyr and have dessert too is the Indian dessert of Bhapa Doi or steamed yogurt – seems improbable, but it works and tastes great. I used the recipe in Sanjeev Kapor’s “How to Cook Indian” and this online recipe is similar.